Apr 07, 2019 at 01:00p.m. - Apr 07, 2019 at 03:08p.m. Most of our wildflower hikes require a trek into the hills, but for this walk we will stay in the flatlands. There is plenty of flora to be found if you know where to look. This will be a slow-paced walk of about one mile. Kids are welcome, but strollers are not recommended because trails are rocky in some areas. Please call (925) 960-2400 for directions if you do not know how to get to the nature area entrance. 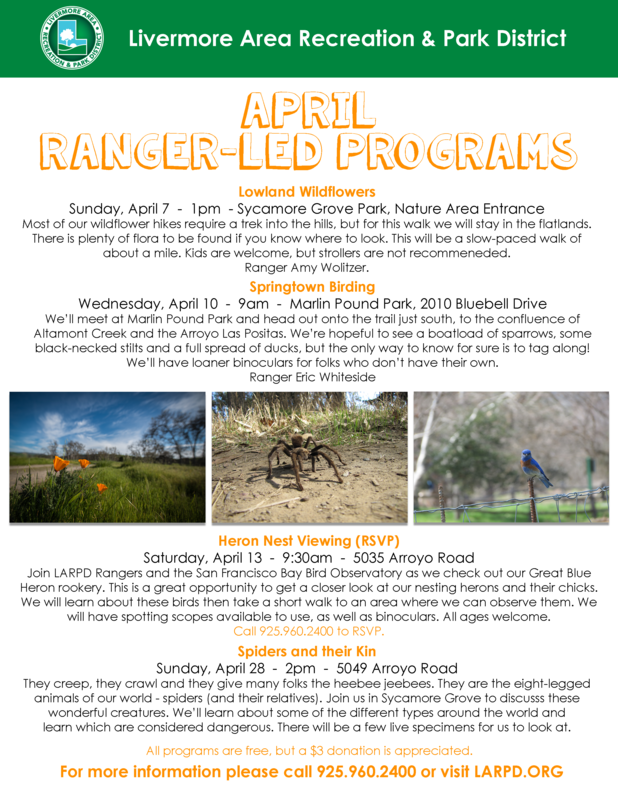 Join Ranger Amy Wolitzer at Sycamore Grove Park, Nature Area Entrance (On Arroyo Road, across from the golf course pond).